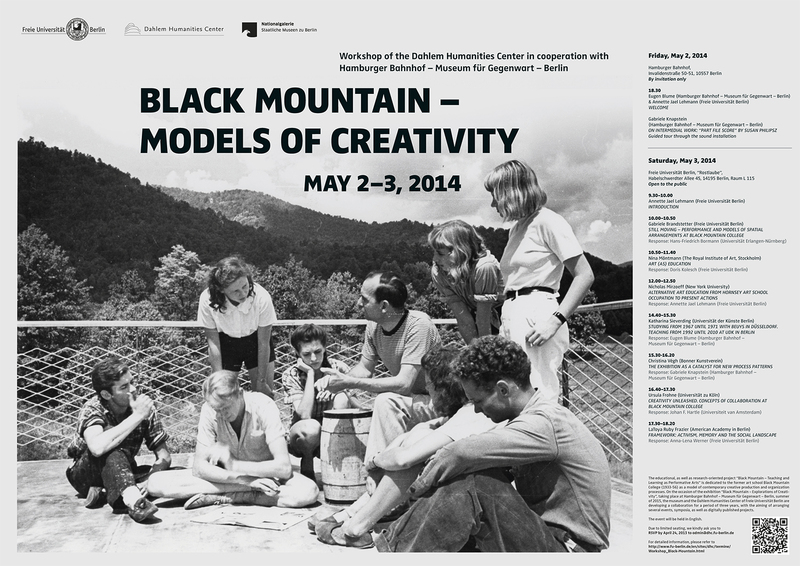 The educational, as well as research-oriented project “Black Mountain – Educational Turn and the Avantgarde” is dedicated to the former art school Black Mountain College (1933-56) as a model of contemporary creative production and organization processes. On the occasion of the exhibition “Black Mountain. An Interdisciplinary Experiment 1933 – 1957”, taking place at Hamburger Bahnhof – Museum für Gegenwart – Berlin, summer of 2015, the museum and the Dahlem Humanities Center of Freie Universität Berlin are developing a collaboration for a period of three years, with the aiming of arranging several events, symposia, as well as digitally published projects. READ THE SPEAKERS’ ABSTRACTS HERE. Eugen Blume was born in Bitterfeld, Germany, in 1951. He studied Art History, Archeology, Aesthetics and Cultural Studies at the Humboldt University Berlin, receiving his diploma with a thesis on the conception of art in Joseph Beuys’ work. From 1981 on, he worked as a research assistant in the copperplate print room of Berlin’s State Museums. Blume obtained his doctoral degree with a dissertation on Ludwig Justi and the Contemporary Museum at the National Gallery between 1919 and 1933. Blume has been working at the Hamburger Bahnhof – Museum für Gegenwart – Berlin, from 1995 onward. Already in 1993, he began setting up the media archive on Joseph Beuys. He has been the director of the Hamburger Bahnhof since 2001, becoming honorary professor at the Bremen Academy of Arts in 2005, and holding the honorary professorship at the Academy of Fine Arts in Braunschweig from 2010 on. Responsible for many exhibitions, Professor Blume has also published widely on the art of the 20th and 21st century. Hans-Friedrich Bormann – Assistant professor (Akademischer Rat) at the Institute for Theatre and Media Studies at the University of Erlangen-Nuremberg. Diploma and PhD in Drama, Theater, Medien (Applied Theatre Studies) at the University of Gießen, between 2003-2009 lecturer at the Institute for Theatre Studies at the Freie Universität Berlin and research associate within the Collaborative Research Centre SFB 447 Performative Cultures. Areas of research: history and theories of the performing arts, relations between writing and sound, aporias of improvisation, John Cage. Gabriele Brandstetter studied German Literature, History, Politics and Theatre Studies at Erlangen, Munich, Regensburg and Vienna. In 1980 she absolved the state examination with a thesis in German Literature about Cosí fan tutte and she made her PhD from Munich University on the lyric poetry of Clemens Brentano in 1983: Erotik und Religiosität. Zur Lyrik Clemens Brentanos. Between 1983 and 1986 she was assistant professor at the University of Bayreuth, at the institute for Musical Studies. In 1993 Gabriele Brandstetter was habilitated from Bayreuth University with: Lecture corporelle. Tanz, Theater und Literatur zu Beginn des 20. Jahrhunderts. She was appointed Professor of Theatre Studies at Justus-Liebig-University, Gießen in 1993 and in 1997 Professor of Modern German Literature Studies at the University of Basel. Since 2003 she is Professor of Theatre and Dance Studies at Freie Universität Berlin. She is co-director of the International Research Centre Interweaving Performance Cultures and Professor of Theatre and Dance Studies at Freie Universität Berlin since 2003. She is also vice-president of Heinrich-von-Kleist-Society and a member of German National Academy of Sciences Leopoldina. Her research focus is on: History and aesthetics of dance from the 18th century until today, theatre and dance of the avant-garde; performance, theatricality and gender differences; concepts of body, movement and image. In 2004 she was awarded the Gottfried Wilhelm Leibniz Prize by the German Research Foundation, and in 2011 the Federal Cross of Merit of the Federal Republic of Germany. Among her numerous book publications: Tanz-Lektüren. Körperbilder und Raumfiguren der Avantgarde (1995;); Tanz-Lektüren. Körperbilder und Raumfiguren der Avantgarde (extended by a third part, ed. 2013); Poetics of Dance (the English translation of Tanz-Lektüren is going to appear at OUP 2013); ReMembering the Body (2000, co-ed. H. Völckers); Bild-Sprung. TanzTheaterBewegung im Wechsel der Medien (2005); Methoden der Tanzwissenschaft. Modellanalysen zu Pina Bauschs ‚Sacre du Printemps‘ (2007, co-ed. G. Klein); Schwarm(E)Motion. Bewegung zwischen Affekt und Masse (2007, co-eds. B. Brandl-Risi, K. van Eikels); Tanz als Anthropologie (2007, co-ed. C. Wulf); Prognosen über Bewegungen (2009, co-eds. S. Peters, K. van Eikels); Improvisieren. Paradoxien des Unvorhersehbaren. Kunst – Medien – Praxis (2010, co-eds. H.-F. Bormann, A. Matzke); Notationen und choreographisches Denken (2010, co-eds. F. Hofmann, K. Maar); Theater ohne Fluchtpunkt. Das Erbe Adolphe Appias: Szenographie und Choreographie im zeitgenössischen Theater (2010, co-ed. Birgit Wiens); Genie – Virtuose – Dilettant. Konfigurationen romantischer Schöpfungsästhetik, (2011); Dance [And] Theory (2013, co-ed. Gabriele Klein). Ursula Frohne, Professor for Art History at University of Cologne, received her doctorate degree at Freie Universität Berlin and was curator at the Center for Art and Media (ZKM) Karlsruhe from 1995-2001. After a Visiting Professorship at Brown University, Rhode Island, she became Professor for Art History at the International University Bremen. Fellowships from the Getty Research Institute, the American Council of Learned Societies and the Pembroke Center supported her research. Between 2007 and 2012 she chaired a project dedicated to Cinematographic Aesthetics in Contemporary Art (http://kinoaesthetik.uni-koeln.de/) funded by the German Research Foundation. Her publications focus on artists’ social history, contemporary art with an emphasis on photography, film, video, installation, political and socio-economic conditions of art and its institutional spheres. Johan F. Hartle is an assistant professor of Philosophy of Art and Culture at the University of Amsterdam (UvA), member of the board of the research cluster Globalization and Aesthetics at the Amsterdam Centre for Globalization Studies (ACGS) and adjunct professor for Aesthetics at the China Academy of Art, Hangzhou, China. Most important publications: Der geöffnete Raum. Zur Politik der ästhetischen Form (2006); Rainer Ganahl – DADALENIN (ed., with Rainer Ganahl) (2013) and Die Sichtbarkeit des Proletariats. Zur Politik des Roten Wien (2014, forthcoming). His book Poetry of the Future. Marx and the Aesthetic (co-edited with Samir Gandesha) is currently under review at Columbia UP. Gabriele Knapstein was born in 1963, and lives in Berlin. She received her doctoral degree in 1999 with a dissertation on the event scores by the Fluxus artist George Brecht. She has been working as a curator for the Institute of Foreign Cultural Relations (ifa), as well as for other institutions, since 1994. From 2003 onward, Knapstein has served as a curator at the Hamburger Bahnhof – Museum für Gegenwart – Berlin and, beginning in 2012, as the Head of Exhibitions. She has been responsible for the ongoing series Works of Music by Visual Artists since 1999. Selected recent exhibitions in Berlin include: Bruce Nauman. Dream Passage (2010); Architektonika. Art, Architecture and the City (2011-2012); Ryoji Ikeda. db (2012); Wall Works (2013) and, most recently, Susan Philips. Part File Score (2014). Doris Kolesch is Professor for Theatre and Performance Studies at Freie Universität Berlin. Her research interests include Comparative Art Theory and History, Cultural History, Media Theory and Aesthetics of the Voice as well as Cultural Theory of Emotions. Her scholarly work has received various prizes and awards like the Heinz Maier-Leibnitz-Award of the German Research Foundation and the German Ministry for Science and Technology or the Essay-Prize of the German Federation for Theatre Studies. She is currently Dean of the Department of Philosophy and Humanities at Freie Universität Berlin. Annette Jael Lehmann has studied Comparative Literature, Art History, American Studies and Philosophy in Berlin, Oxford and Berkeley. She had guest professorships in the USA, among them at the University of California, Los Angeles and at the California Institute of the Arts, and was from 1999-2005 researcher at the collaborative research centre SFB 447 Performative Cultures at the Freie Universität Berlin. Since 2007 she is Professor in Visual Culture and Theater Studies at the Freie Universität Berlin. Her interdisciplinary research focus is on: Visual Culture, Performance Studies, Contemporary Arts and Aesthetics, Gender- and Queer-Studies and Digital Humanities. Her publications include: Im Zeichen der Shoah. Aspekte der Dichtungs- und Sprachkrise bei Rose Ausländer und Nelly Sachs, Tübingen 1999; Un/Sichtbarkeiten der Differenz. Beiträge zur Gender-Debatte in den Künsten, Tübingen 2001; (with Jutta Eming und Irmgard Maassen) Mediale Performanzen. Historische Konzepte und Perspektiven, Freiburg 2002; Kunst und Neue Medien. Ästhetische Paradigmen seit den sechziger Jahren, Tübingen 2008; Exposures. Visual Culture, Discourse and Performance in Nineteenth-Century America, Tübingen 2009; Environmental Art. Kunst/Medien/Umwelt, Bielefeld 2014. She was awarded the first price of the Junge Akademie at the Berlin-Brandenburgische Akademie der Wissenschaften and the Deutsche Akademie der Naturforscher Leopoldina in 2002 and is fellow at the Rothermere Institute for American Transdisciplinary Studies at the University of Oxford. Nicholas Mirzoeff is Professor of Media, Culture and Communication at New York University. He is the author of The Right to Look (2011), which won the Anne Friedberg Innovative Scholarship Award from the Society of Cinema and Media Studies in 2013. He is also the convenor of the Militant Research Collective and is engaged in a collaborative writing project: After Occupy: What We Learned. Nina Möntmann is Professor of Art Theory and the History of Ideas at the Royal Institute of Art in Stockholm, curator and writer. Recent curated projects: Harun Farocki – A New Product (Deichtorhallen Hamburg, 2012); If we can’t get it together. Artists rethinking the (mal)functions of community (Toronto, The Power Plant, 2008); The Jerusalem Show: Jerusalem Syndrome (together with Jack Persekian, 2009); the Armenian Pavilion for the 52nd Venice Biennial. Recent publications include the edited volumes Brave New Work. A Reader on Harun Farocki’s film ‘A New Product’, engl./dt. (Cologne, Verlag der Buchhandlung Walther König, 2014); Scandalous. A Reader on Art & Ethics (Berlin, Sternberg Press, 2013); New Communities (Toronto, Public Books/The Power Plant, 2009) and Art and Its Institutions (London, Black Dog Publishing, 2006). Katharina Sieverding was born in Prague, and first studied at the Hochschule für bildende Künste Hamburg, from 1963 to 1964, after which she worked with Teo Otto at the State Academy of Arts Düsseldorf, until 1967. In the following years, Sieverding worked with Joseph Beuys (until 1971), and then with Ole John (until 1974). In the course of the years from 1972 to 1988, she visited the United States, the People’s Republic of China as well as the Soviet Union for studying purposes. During those years, she also joined the Whitney Museum of American Art, New York, for an independent study program (in 1976), the Graduate Faculty of Political and Social Science at the New School for Social Research, New York (in 1977), while giving various lectures and performances as well as conducting several installations in the US and Canada (including in Toronto, Montreal, Minneapolis, Los Angeles, San Francisco). From 1990 to 1992, Sieverding lectured at the Hochschule für bildende Künste Hamburg as a guest professor and, from 1992 to 2010, as a senior professor at the Universität der Künste Berlin. Her professional work abroad included, from 1995 to 2013, the International Summer Academy of Fine Arts Salzburg; from 1995 to 1999, teaching at the Center for Contemporary Art Kitakyushu, Japan; as well as lecturing at the Atlanta College of Art (in 2001), at the Washington University Saint Louis (in 2002), at the China Art Academy, Hangzhou, Shanghai (2002 to 2003), at the Academy of Performing Arts Prague (in 2005), at the Harvard Art Museums, Cambridge, Massachusetts (in 2012), but also in Germany (Berlin, Kiel, Potsdam-Babelsberg, among others), most recently, as part of a lecture series at the Academy of Fine Arts Münster. Moreover, Professor Sieverding served as a member of the university council of the Academy of Fine Arts Vienna, from 2008 to 2013. From 1965 onward, Sieverding has been partaking at myriad international exhibitions, including the following: the Biennale de Paris, Musée d’Art Moderne (in 1965, 1973), the documenta in Kassel (in 1972, 1976, 1982), the Biennale di Venezia (in 1980, 1995, 1997, 1999); most recently, at the Wack!-series in Los Angeles, Washington DC (in 2007), and New York, Vancouver (in 2008) as well as at the Glam!-series in Liverpool, Frankfurt a.M., Linz (in 2013). Christina Végh, born in Zurich in 1970, has been the director of the Bonner Kunstverein since 2005. Végh studied art history, ethnology and philosophy at the University of Zurich and Santa Cruz (California), after which she worked as curator at the Kunsthalle Basel, from 2000 to 2004. She has worked with artists such as Ed Atkins, John Baldessari, Ryan Gander, Charline von Heyl, Gregor Schneider, and Brian Jungen. Her experimental art education program Kunst-Stück received an award from the state of North Rhine-Westphalia (2009); for her achievements she received the Swiss Art Award from the Swiss Federal Office for Culture (2010). Anna-Lena Werner is an art historian and studied at Freie Universität Berlin and at Chelsea College of Art and Design in London. She works as an art writer, curator and currently writes her PhD with a thesis on trauma and multi-media art at Freie Universität Berlin. Her research is funded by the Studienstiftung des Deutschen Volkes. Since 2010 she runs the artblog artfridge.de.